Historically, still life was a decorative genre largely characterized by an aesthetic rather than illustrative value. It was popular among artists allowing them to arrange composition elements at will and had a huge success with buyers that needed something intricate and noble-looking to emphasize their social status. In the 20th century, though, still life stopped being just still life and became a space for artistic experiments. 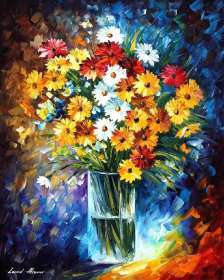 Famous modern artist Leonid Afremov particularly enjoys creating flower paintings, which is one of his favorite genres along with cityscapes. In a gallery section devoted to still life art, you can find a great number of beautiful artworks depicting carefully adjusted flower, fruit and dish compositions performed in his signature Impasto manner. What makes this painting technique so special is the use of a layered texture created by applying thick strokes of paint over one another. As a result, the painting gains a profound three-dimensional feel and a very contemporary look. Each artist uses an individual layer pattern that makes his works unique and defines their artistic value. Putting paint in neat abrupt strokes, Afremov creates whimsical flower sets pleasing the eye with bright cheerful colors. In contrast to the heavy luxury of traditional medieval still lifes, his works look simple yet inexplicably appealing. By engaging the viewer into a subtle play of shades and adding volume to the composition through the use of multiple layers, Leonid smears the line between imitation and imagination making his flower paintings abstract and highly realistic at the same time. It seems you can just hold out your hand and touch the delicate petals! Note how the background complements the central piece of the artwork. 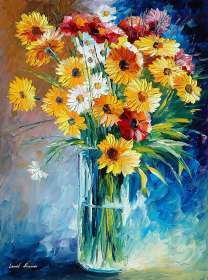 On some paintings, Afremov simply applies rough strokes in a random pattern making a minimal use of his palette, others come with a speckled multicolored background typical for the Impressionist style. 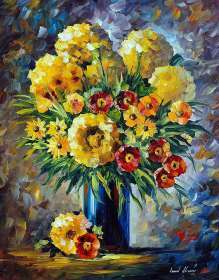 All planes of Afremov still lifes interact in a smart and spectacular way giving you a sense of harmony and beauty. Aside from flowers, the artist indulges in painting bottle and book still lifes frequently combining them together in one artwork. Being an avid reader, he has collected a great number of books that he rereads time and again in his favorite armchair by the fireplace. The book sets featured in this section represent the actual interior design solutions used by Afremov to create a cozy atmosphere in his studio. Leonid also appreciates fine drinks and never misses a chance to take a bottle of good wine home when returning from another trip to Europe. He has a bar where he stores the best samples for a special occasion. On some of the pictures, you can see part of his impressive beverage collection spanning drinks from many countries of the world. 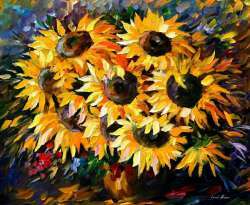 Finally, Afremov also uses classic fruit and dish themes in his still life painting practice. Even here he comes up with highly imaginative, totally unexpected concepts. Just check out this eccentric apple and mango set composed around a lady’s shoe! Or take a glance at this nicely served, candle-lit dinner table enigmatically shimmering in the dark in a swirl of colorful sparkles! Looks like little magic, doesn’t it? This artist knows how to draw the viewer’s attention! 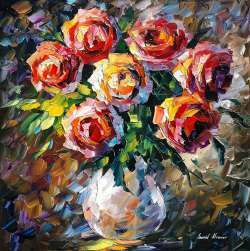 So again, what’s so special about Leonid Afremov still-lifes? They are universal and can be used anywhere from living room to kitchen. They are beautiful, unique and contemporary-looking. They are colorful and cheerful – perfect for lighting up a dull interior. They restore your faith in harmony and magic! Look through the online gallery to choose a painting to your liking and give your home, studio or office a splash of color and positive emotions! To read more about category "Flowers, Still life" click "Read More"